Driving in France with children has similar rules to driving in the UK but with a few minor, but very important differences! The driver is always responsible for ensuring all juvenile passengers are restrained in the appropriate way. Juveniles include all those up to the age of 18. The main difference between driving in the UK and driving in France with children are the rules governing child seats and where children can sit in the car. If there is no rear seat fitted in that vehicle. The child is a baby who is in a rear facing baby seat and the airbag is turned off. Secondly, children up to the age of 10 must be using an approved restraint or child seat. This must be suitable for both their age and also their size. There is no upper height limit as in the UK. Children can wear adult seat-belts if the seat-belt sits across their shoulder and not their neck. The type of car seat and the locations where they can be placed in the vehicle for children in France are determined by weight. Children weighing under 10kg must be in a rear facing children’s seat or carry cot. If in a carry cot they must be in the rear of the vehicle. However if rear facing they can occupy the front passenger seat if the airbag is off. Children under 13kg must follow the same rules as those under 10kg. Children between the weights of 9 and 18kg must use a suitable car seat. Those between 15 and 36kg must be sat on a booster seat or car seat using an adult belt. As you can see the rules are very much similar to those in the UK. The main difference is the rule about no children in the front seat. Therefore please make sure you don’t fall foul of these laws. 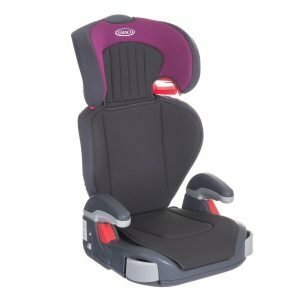 If you don’t have a suitable child car seat or are looking to buy a new one, you can do so in our online shop. If your children fail to be restrained by the appropriate car seat then you could end up with a fine. The current fine is set at €135 and for drivers there is also a 3 point penalty. Although at present points are not added to UK licences, European governments are looking to change this.